I was hoping to get this project up last month but I wasn’t able to due to all the other things going on. 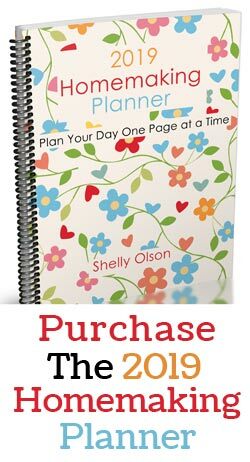 I was hoping to have it up before Christmas for a homemade gift idea but at least you can tuck this idea away for next year or make one for yourself. I found some great used wool sweaters at the thrift store for this project but if you have one or two you no longer wear those would be great to use. 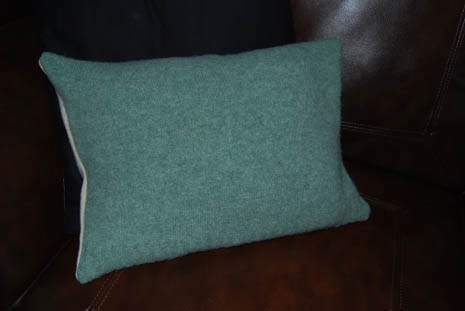 For this project you will need a wool sweater or two and a sewing machine to sew the pillow cover up. 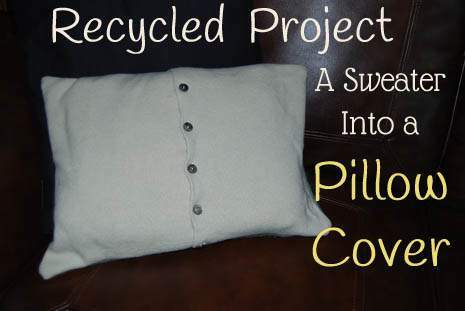 I used two different sweaters a cardigan and a pullover to complete my pillow cover. 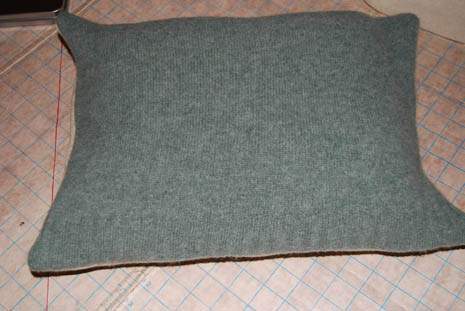 I like using a cardigan as it makes for a handy opening so you can stuff the pillow with a pillow form or stuffing without having to leave an opening when sewing. The first thing you want to do is to wash your wool sweater on hot in the washing machine. A top loading washer works best to full the sweater but I was able to get mine done in my front loader although it didn’t work quite as well as my old top loading machine. I also put the sweater I was washing inside of a pillowcase and tied the opening before adding it to the washer to catch any loose fibers. The sweater will be quite a bit smaller when done. This technique will work best with 100% wool sweaters but a lesser wool content will still work. After the sweater is washed and dry I will cut the two layers apart. 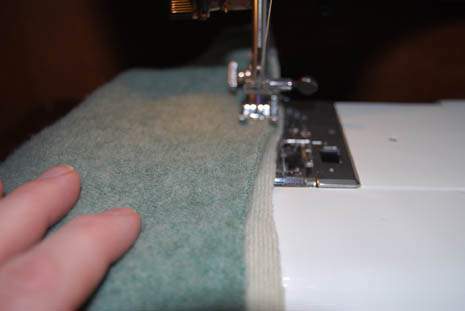 (separate the front from the back by cutting along the seams.) 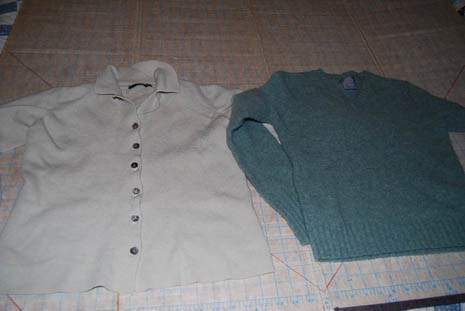 I used the two fronts of my sweaters but a front and back will also work. 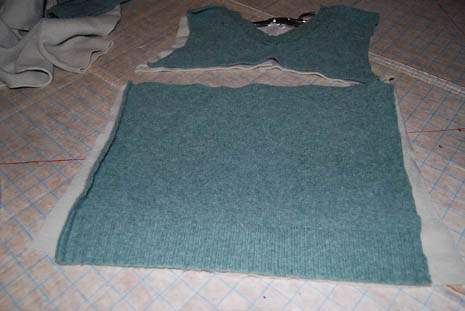 The next step is to cut the size you need out of both the sweater pieces. I just lay one on top of the other and cut across at the underarms. This made a great size for my pillow. 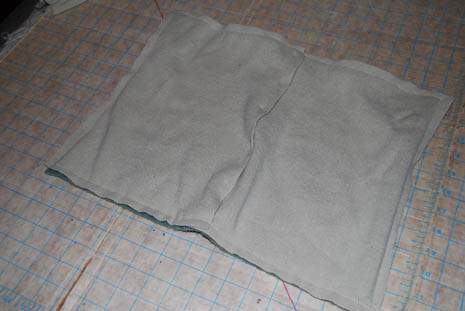 Once you have your two pieces in the size you need it is time to sew around the edges. Line up edges with right side together and pin to keep them in place. 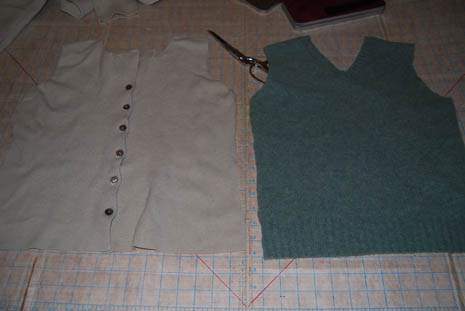 (you will see in my photos I skipped the pinning step but if you don’t sew much the pinning will be helpful) If you have used the front of a cardigan sweater like mine just sew all the way around leaving about a half-inch seam. If you don’t have a cardigan button opening you will want to leave a small opening to be able to turn and stuff your pillow. Turn right side out. Poke out the corners so they are all nice and smooth. Stuff the pillow and button up the opening of the cardigan or sew your opening by rolling the raw edges in and pinning and then whip stitch closed by hand to have a nice finish, you can edge stitch all the way around for a more finished look. That’s it, this project is a quick one and can be done in about an hour after the washing and drying are all done. I am always on the lookout for wool sweaters that are cheap at garage sales, estate sales and thrift stores you can make so many items out of them.